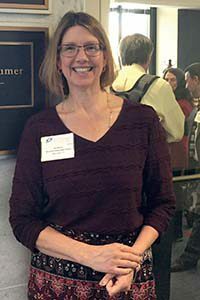 WVHS science teacher Lisa Reece was one of 200 participants in this fall’s Research Teachers Conference in Washington, D.C. Sponsored by the Society for Science & the Public, this annual weekend gathering is an opportunity for science research teachers at all levels of experience to share best practices and troubleshoot the challenges they face in supporting students in independent science research. Conference topics included completing research in a high school lab, finding and placing students in summer programs, obtaining pre-approval for projects relating to humans and animals, combating plagiarism, reaching under-served students. As a result of the conference, this year’s science research seniors will be submitting their research to some very prestigious science competitions. These include the Regeneron Science Talent Search and Intel’s International Engineering and Science Fair, along with the Junior Science and Humanities Symposium.